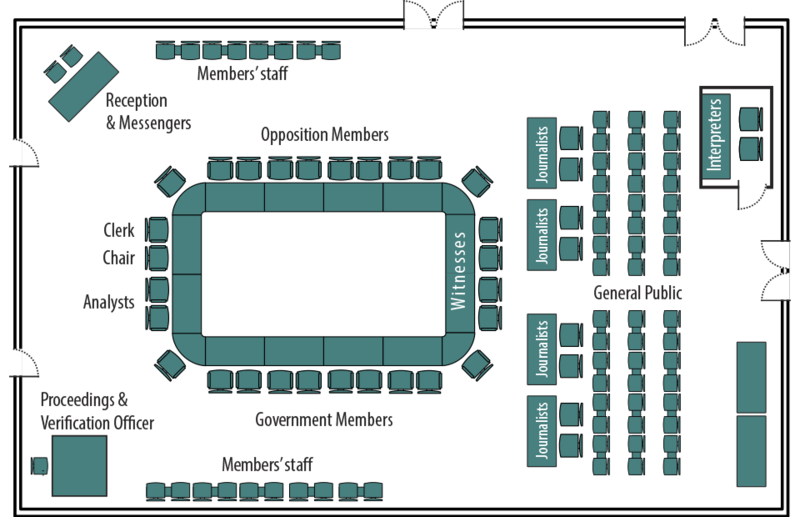 The House of Commons Foyer is a rectangular, two-storey arcaded hall. This lofty ceremonial space consists of heavy piers joined by moulded arches supporting, beneath a glazed ceiling, an arcade of black marble columns. The pointed arch - a dominant feature of the overall design - is repeated on the surrounding walls, and frames the elegant entrances to the Chamber and to the ministerial suites. 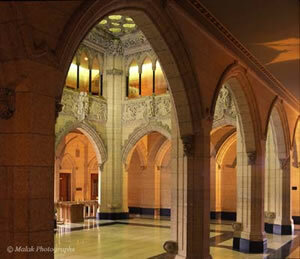 The importance of the House of Commons Foyer is reflected in its generous scale and full Gothic Revival treatment. It is among the most ornate spaces within the Centre Block. Its exquisite materials - polished marble floor, sculpted limestone walls, coloured art glass, carved oak - as well as gilt-framed portraits of Prime Ministers, all contribute to the dignified character of the Foyer. A variety of native and imported stones were selected for the area. The Commons Foyer is clad with Tyndall limestone on a Missisquoi Black marble base. Indiana limestone was added for fine sculpture work. The polished marble floor is a field of Missisquoi Boulder Grey with interior borders of Verde Antique serpentine. In addition, a fine Rose Tavernelle marble balustrade separates the Commons Foyer from the lower entrance hall.